Photo by Alejandro Mancilla / The Rag Blog. All rights reserved. In early September, tens of thousands of teachers gathered from all over Mexico to march in the nation’s capital against recent educational reforms proposed by President Enrique Peña Nieto and approved by Congress. Teachers have marched at least 15 times over the past two months to protest against this legislation. The reforms include teacher evaluation policies and standardized testing like those in the US “No Child Left Behind” Program. The legislation has infuriated Mexican teachers, because they want more focus on resolving underlying structural problems related to education. The new test-based hiring and promotion system will allow the government to take a large measure of power from teachers’ unions. In his first six months in office, Peña Nieto has passed labor reforms that allow outsourcing, lower the minimum wage, increase part-time employment and strip away job protections. His priorities so far have been closely tied to business interests and have included few protections for workers and little regard for protest and other forms of nonviolent civil resistance. He has also been investigated by the Mexico City human rights commission, which found evidence of police brutality and arbitrary detentions during protests against his December 1, 2012 inauguration. 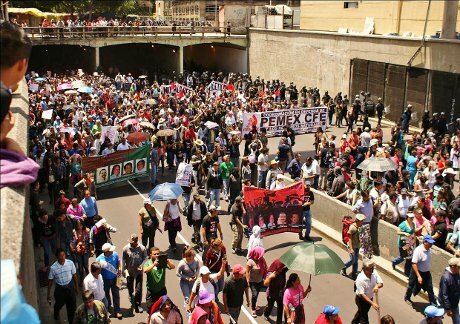 The teacher protests were organized by the Coordinadora Nacional de Trabajadores de la Educación (CNTE), the smaller of two teachers unions in Mexico. Since the early ‘70s, teachers unions have organized massive mobilizations to protest state policies related to education, especially policies that seek to weaken the power of unions. For example, in the ‘80s, the unions opposed government austerity policies brought about by the devaluation of the peso. After massive 1989 protests, the government responded to the economic demands made by the teachers unions, and teachers received pay increases in 1989, 1990 and 1991 that outpaced increases in other sectors. Today, the average teacher makes around $600 (8,000 pesos) a month or less. The teacher’s movement in Mexico has been successful in mobilizing large numbers of people - including students, women and indigenous groups - to participate in public actions such as marches, sit-ins and demonstrations. However, there have also been consistent problems of corruption within teachers’ unions, including the sale of jobs. This has already divided public opinion and the media consistently describes protesting teachers as “lazy,” for supposedly protesting instead of being in the classroom. The dysfunction of Mexico’s educational system has been documented in recent documentaries such as De panzazo (2012), which means “belly flop.” It shows that, in addition to inadequate supplies and classrooms, teachers are often unprepared for class or don’t show up. Recently, Elba Esther Gordillo Morales, the leader of the 1.4 million member Sindicato Nacional de Trabajadores de la Educación (SNTE), the largest labor union in Latin America, was jailed on corruption charges. Gordillo ran the SNTE for 23 years, but her multiple international vacation homes and her penchant for luxury clothing rankled ordinary Mexicans. After she was jailed, it was discovered that she spent more on clothing at Neiman Marcus than pop singer Beyonce. Backers of the current educational reform legislation, which also seeks to dismantle unions, argue that it will prevent corruption. Teachers agree that they also want educational reform, but they disagree with the methods that the government wants to impose to achieve it. For example, teachers in states like Oaxaca that are home to diverse indigenous groups worry that standardized legislation and testing will not allow them to teach indigenous history or languages. In general, teachers are most worried about what they see as the starvation of the public education system, which many believe is a deliberate strategy to so weaken public education that privatization seems like the only option. Their buildings and resources have been neglected for decades, yet now they are going to be more stringently evaluated after having taught in dilapidated, leaking, cold classrooms, and having bought supplies for their students out of their own incomes. Photograph by Rodrigo Jardón. All rights reserved. Many teachers gave up weeks of their lives to organize and try and force the government to include them in the dialogue about educational reform. A teacher from the Tlaxiaco region of Oaxaca who was part of the march noted that as “in all movements, there is always a physical and economic cost. We are resisting this legislation with the support of our families and our people.” Teachers who supported the march and occupation in various cities faced government and media criticism that they had abandoned their work, which has been the common government criticism of peaceful demonstrators in Mexico. 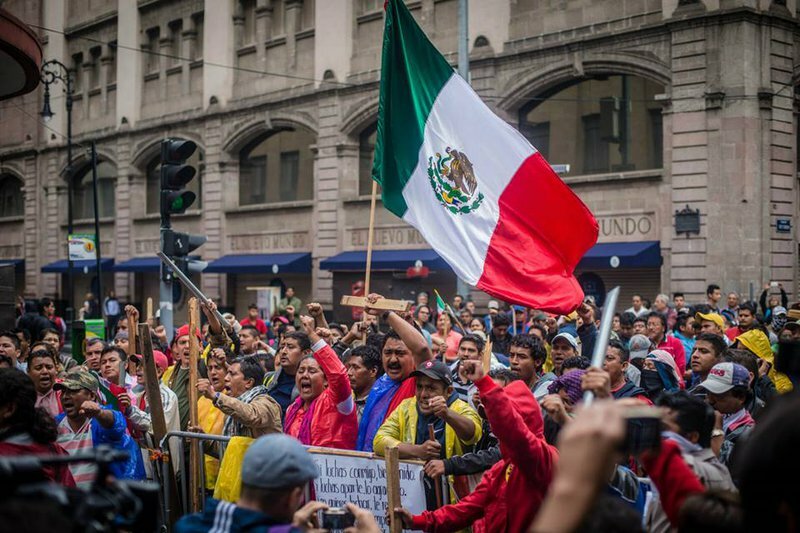 The Mexico City protests led to an occupation of the Zócalo in the center of the city. Thousands of teachers, joined by youth from the #YoSoy132 movement, camped out until September 13, when riot police wielding plastic shields, helmets, tear gas, batons, water cannons and rubber bullets drove them out. The police, backed by armored vehicles and helicopters, skirmished with some missile-throwing protesters. The teachers’ movement claimed that the violent protesters were part of a radical flank that was perhaps even hired by the government to create unrest. In Mexico, government officials have often been accused of planting violent protesters in nonviolent movements in order to justify the use of police force. Several protesters were reportedly injured, and 31 people were arrested when the police entered the square. The government decided to use force against the protesters to prepare for Independence Day celebrations on September 15. Since it is President Peña Nieto’s first term in office and he was scheduled to carry out an important Independence Day ritual in the Zócalo, it has been argued that he cleared the square to avoid political embarrassment. Dominicano, a protester who gave only his first name, discussed how the government had “tried to criminalize a nonviolent protest.” Peña Nieto, who came into office in December 2012, also authorized arrests and detentions to deal with protests against his inauguration. Although President Peña Nieto sent out last minute Independence Day invitations to dignitaries, his actions against protesters leave many Mexicans wondering how much there is to celebrate. Teachers, for their part, have promised to continue organizing nonviolent actions and occupying Mexico City to bring attention to material problems in public schools. On September 19 and 20, teachers organized a national strike in response to the police actions carried out in the Zócalo. On September 21, union leaders attended the Third Popular Teachers Summit to analyze their strategies and prepare for future action. However, many teachers from the poorest southern states, like several of those interviewed who were from Oaxaca, face growing economic pressures. For now, the support of their communities, both financial and otherwise, allows them to participate in the democratic process and work for reform from below. The teachers’ protests in Mexico may be not only a reaction to what they perceive as misguided or destructive proposals for change in education, but perhaps also a response to not having been able to play much of a direct role in framing such proposals. As professionals who care about the children and young people with whom they spend their days, teachers are not only employees, they know that they help shape the abilities of new generations to build a better society. They are, in a word, stakeholders in the country’s future: they are citizens. And just as citizens in other democracies such as Brazil, Egypt, Turkey and other countries have risen up in recent years to challenge publicly the failures of their governments, Mexican teachers are bidding to be part of the decisions that affect not only their jobs but also the country they love – by taking direct nonviolent action when it’s necessary to insist that they be part of public decision making.